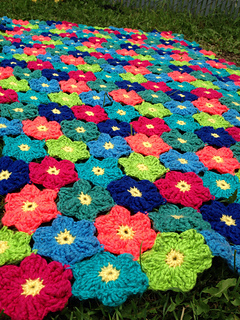 On a flight home from Hawaii last summer, I began envisioning a flower blanket that reminded me of the glorious, bold flowers I had seen while visiting the beautiful islands there. So on the plane I began furiously designing--and this beautiful blanket is the result of that inspiration! It is thick and warm yet breathes. And the back of the flowers look as beautiful as the front! This pattern and photo-tutorial has been thoroughly tested and edited for errors and clarity. Skill Level: Intermediate due to the join-as-you-go process. Written in American English crochet terms. 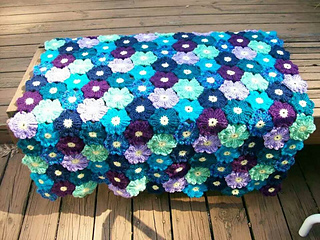 When you purchase $16.50 worth of patterns, enter code SAVE3 at checkout for a $3 savings. Due to the nature of patterns, this pattern may not be returned or exchanged. All sales are final. This pattern may not be redistributed or copied in any way. Finished items may be sold, I just ask that you give credit to me, Susan Carlson at FeltedButton.com or feltedbutton.etsy.com for the pattern.